U.S. 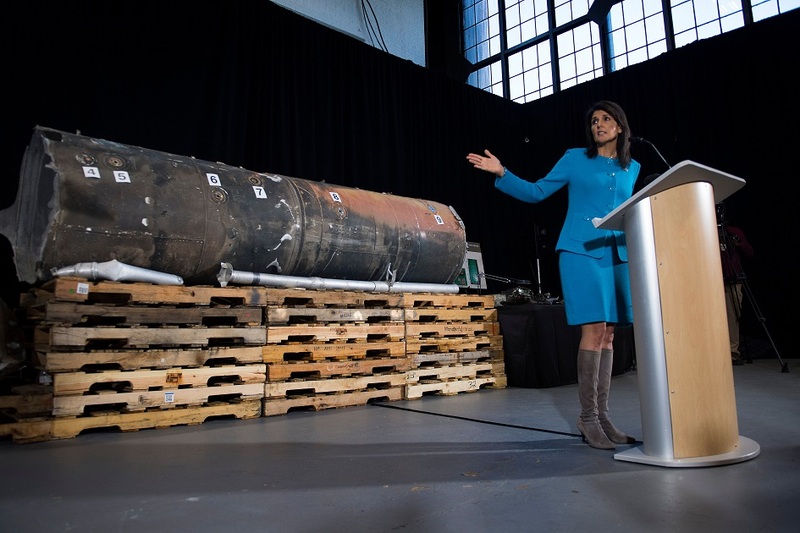 Ambassador to the U.N. Nikki Haley presents recovered missile parts the U.S. say were provided by Iran to Houthi rebels that represent evidence Iran is arming dissidents. U.S. intelligence has determined that two ballistic missiles fired on Saudi Arabia this year were manufactured and provided to Yemen Houthi rebels by Iran, U.S. Ambassador to the United Nations Nikki Haley announced Thursday. Haley, who stood in front of components from both missile launches, said the evidence behind her proved that Iran is in violation of a UN resolution that supported the Joint Comprehensive Plan of Action, the agreement former President Barack Obama’s administration signed with Iran to halt its nuclear weapons program. While the JCPOA itself does not specify ballistic missiles, that resolution called for Iran to also halt its ballistic missile weapons program. “Iran is defying the international community,” Haley said. Haley said President Donald Trump and his administration would be working with the international community and Congress on how to increase enforcement of the ballistic missile terms in the UN resolution. The Scud-class 37-foot-long missiles targeted King Khalid International Airport on Nov. 4 and Yanbu, Saudi Arabia, on July 22. “Just imagine if this missile had been launched against Dulles Airport, or JFK,” Haley said. At a hangar on Joint Base Anacostia in Washington, the U.S. Defense Intelligence Agency had reassembled components from the two launches to establish that both were Qiam short-range ballistic missiles and in a briefing with reporters, identified the markings that they said proved the missile was manufactured in Iran. A defense official who spoke on the condition of not being identified said that some of the wear they analyzed on the missiles, including evidence that the missiles have been welded back together, supported their assessment that at least the Nov. 4 missile had been cut in half to more easily transport into Yemen. 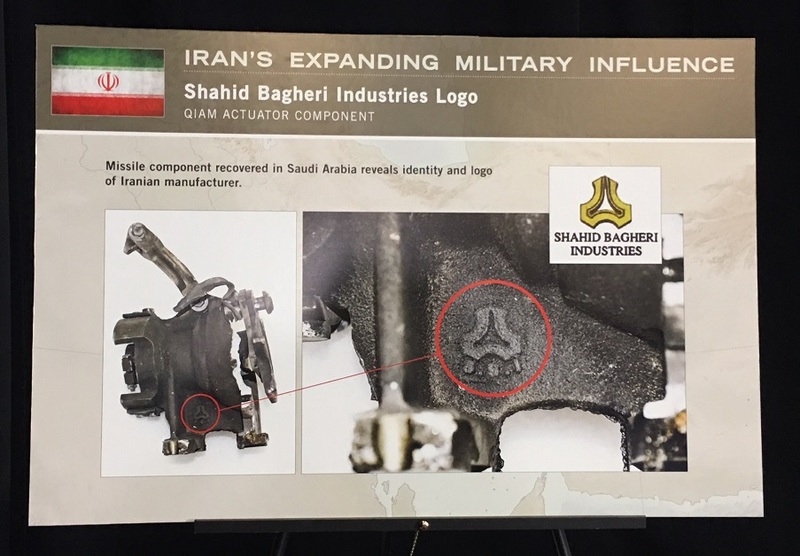 In another display in the hangar, the DIA pointed to the manufacturer logo on the missile actuator, which they said belongs to Shahid Bagheri Industrial Group, an Iranian manufacturer. Houthi rebels, who are in a civil war with Yemen’s government and have been targeted for more than a year during a Saudi-led and U.S.-supported air campaign, claimed responsibility for the Nov. 4 ballistic missile launch. The agency also reassembled drones and recovered parts of remotely controlled explosive boats it said Iran used to strike the Saudi frigate HMS Al-Madinah in the Red Sea on Jan. 30. “Several countries will be sending delegations to view this material” in the coming days, Haley said, as the U.S. works to build support to increase pressure on Iran.